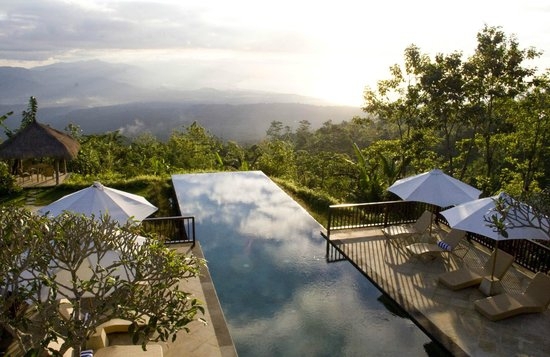 Munduk Moding Coffee Plantation Nature Resort and Spa is a luxury boutique hotel, the only hotel in Bali situated on a working coffee plantation. It is situated close to Bali's central lakes and Munduk Hill Station. The hillsides are covered with jungle, coffee trees, clove bushes, hydrangeas and rice fields. Taking one of only 17 villas and suites on 5 hectares of land, you can enjoy all this in privacy and genuinely relax far away from the crowds. Munduk Moding Plantation offers cool mountain air, spectacular sunsets and stunning panoramas of the rice fields and rainforest and sometimes the coastline in the distance when the mist clears. The staff are mostly from Munduk and Gobleg villages, trained to a high standard and motivated to cater to the needs of discerning visitors. Besides providing employment, Munduk Moding Plantation engage staff and their families in activities that maintain the tropical rainforest and preserve water. There is a water recycling plant hidden discreetly in the vegetation and the water is reused in the gardens. Along from the filtration plant is a vegetable and strawberry garden. Young village girls are encouraged to keep their cultural heritage alive with traditional dance, music and crafts. Dance performances are often presented after dinner on the second floor of the Mimpi Restaurant. COOL TIP: Take a cardigan for the evenings.